This is a book that gives one the urge to read it in single sitting. 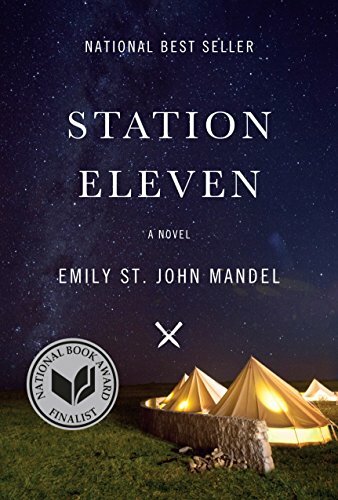 The connections among five people are plotted with such beautiful intricacy and surprise that one hesitates to put down Emily St. Mandel’s Station Eleven. The draw of having to know what comes next permeates the entire novel. But a clever delectable plot combined with beautiful, at times even poetic, writing is what makes this book stand out. The story starts when a famous actor drops dead during a production of King Lear. The narrative then moves backward and forward in time, taking us from the actor’s early fame as a film star to an apocalyptic future in which civilization has collapsed, and the sparse survivors behave like feral animals. The five intersecting characters who move through time are the actor, the man who tried to resuscitate him, the actor’s first wife, his oldest friend, and the young actress who as a child saw him die on stage, and is now part of a theatrical troupe called the “Traveling Symphony” that wanders the badlands of what civilization remains. The author’s previous three novels were all Indie Next picks, and in this one her writing is lambent, elegiac, and richly detailed. Nobel author Doris Lessing was roundly criticized for the crime of stooping to science fiction in her five–volume Canopus in Argos series. The reason science fiction had such a shoddy reputation, Lessing said, was that so few good writers ever attempted the form. Happily, St. John Mandel is one of those “good writers.” Her novel is science fiction, but it is also much more. It compares well to C. S. Lewis’s classic trilogy, Out Of the Silent Planet, Perelandra, and That Hideous Strength. It may even surpass it. But one shouldn’t pass it by simply because it contains sci–fi elements. In Station Eleven St. John Mandel gives us a deeply felt story of human survival; of friendship that endures and abides the twists of fate; of the ability to live in the moment and see beauty in the world as it is, no matter the degradation of either the planet or the people on it.